Last night's episode of Mercy Street included a poignant scene in which the Green and Fairfax families attempted to bury Tom Fairfax. No matter one's sympathies, seeing a funeral disrupted at gunpoint was not pleasant. I do not know of an incident in which Union soldiers disrupted a funeral (please let me know, if so), but, according to the book Alexandria in the Civil War by James Barber (pg. 25), "town jeweler Benjamin Barton was refused the burial of his child in the town cemetery until he had sworn allegiance to the United States." A transcribed list of Alexandrians who took the oath, online through the Alexandria library, does not include a Benjamin Barton although does have a merchant and a brass finisher with somewhat similar names. But anyway..back to the cemeteries themselves. 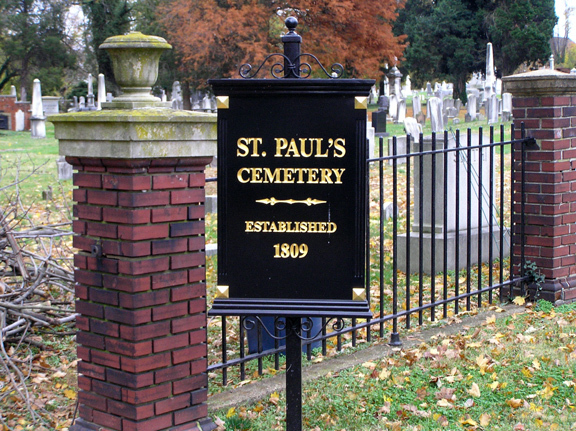 In 1804, city leaders required that new cemeteries locate outside of the city limits. Different churches had (and still have) plots south of Old Town, in an area that is still peaceful and quiet, despite development encroaching from all sides. The Fairfaxes probably belonged to St. Paul's or Christ Church Episcopal Church. At first, freedmen were buried in the paupers' cemetery, known as Penny Hill. Soldiers were buried in the area as well, although not in a specified military cemetery. Coming from there I saw an ambulance containing 3 coffins driven towards the cemetery. Contrabands I suppose. Then a soldier’s funeral; & while at the barracks, there was another soldier’s funeral, & afterwards I saw a citizen’s funeral. The overseer at the barracks said he had seen 12 & 14 pass them in a day, & this wd. not include what passes on Duke St. I think there are funerals here from morning till night. The numbers of dead meant expanded needs for burial grounds. In 1862, the Soldiers Cemetery (now Alexandria National Cemetery) was established--though of course much smaller, it is older than Arlington Cemetery. In 1864, the Freedmen's and Contrabands Cemetery opened on a confiscated estate further south of town. In late 1864, members of the U.S. Colored Troops protested the practice of burying their dead in the Freedmen's Cemetery, rather than in the military cemetery. Their protest, which culminated in a petition that reached Quartermaster Montgomery Meigs, succeeded so that the soldiers already buried were disinterred and re-interred in the Soldiers' Cemetery (although black and white are segregated in death as they were in life). Ironically, their protest also preserved their identity in death. While the military cemetery kept records, when known, of who was buried where, the Freedmen's Cemetery was more a jumble. The names were recorded but not specific locations. Moreover, the cemetery was accidentally or willfully forgotten, and various buildings, including an Esso station that I remember from the 1980s and 1990s, operated right over the cemetery. It was re-discovered while preparing the area for the newly built Wilson Bridge. Archaeological excavations revealed remains, which were documented but not further disturbed. Using the record of names, genealogist Char Bah located more than 1,000 of the descendants of those buried at Freedmen's, which was rededicated in September 2014.